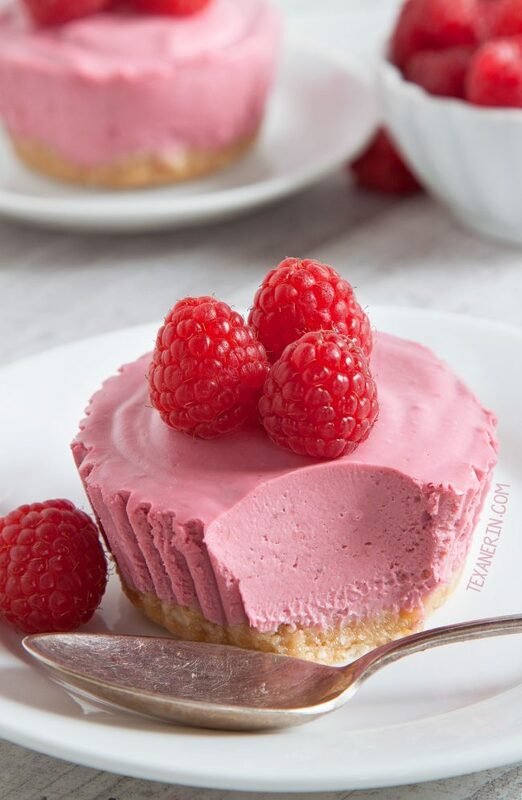 These paleo no-bake raspberry cream pies have a super smooth and creamy filling and a cashew and toasted coconut-based crust. 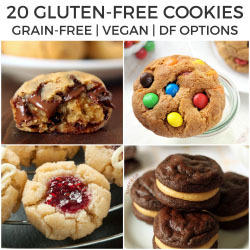 Vegan, grain-free, gluten-free and dairy-free. I wasn’t really sure what to call these. 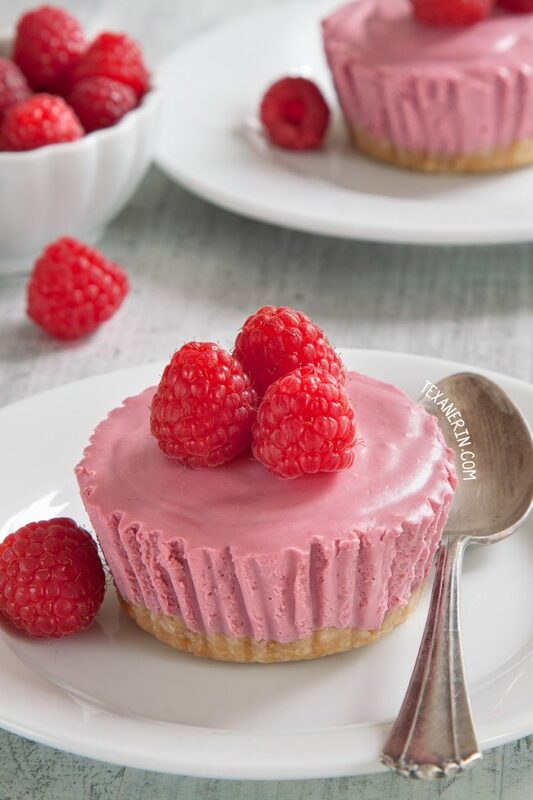 They’re not like vegan cheesecakes and they’re not like regular raspberry pies… they’re something new and different. :) I guess they’re sort of mousse-like? But not really. Because of the large amount of berries (3 cups!) in here, they have a bit more water in them than regular vegan “cheesecake” recipes and are therefore softer and not as firm. Mr. Texanerin said he didn’t like the soft texture of these. He wanted the mixture to be thicker, like cheesecake. Well. I wanted the filling to be super raspberry-y and changing the recipe to add something else to firm up the texture lessened the raspberry taste. Besides. I love the texture! It’s soft and creamy. If you make them and decide you want the filling firmer, just freeze the pies for a while. But if you freeze them for 6+ hours, they’ll need about an hour to defrost at room temperature. There’s also a ton of fat. I guess you could consider these (healthy) fat bombs! If you want even more fat, you can up the coconut oil to 1 cup. They taste just the same and the texture is weirdly almost exactly as firm, too. And if you hate coconut, don’t make these. With the unrefined coconut oil and coconut cream, they have quite a bit of coconut taste to them! One thing that’s important is to make sure all your filling ingredients are room temperature or even a little warm or else the coconut cream and coconut oil won’t blend together properly. I’ve done that a few times and it’s really not a nice texture. To be on the safe side, I suggest very lightly warming everything together. If you decide to bypass that step and your ingredients are too cool, creating a gritty texture after blending, pour the filling mixture into a little saucepan and lightly heat until warm. It should then be smooth, but if it’s not (like if the raspberries didn’t get blended because you used frozen raspberries), then put it back in the blender for a little more processing. The filling makes enough for 14 pies but that’s an awkward number so I recommend making 12 pies and then pouring the remaining filling into two ramekins or some kind of glass that you can enjoy right away. Or just eat the remaining filling from the bowl with a spoon! For another no-bake paleo vegan treat, try this 5 Minute Mango Sorbet from Perry’s Plate! Please read the full recipe including the notes at the bottom before starting! Line a muffin pan with 12 muffin liners. Prepare the crust. Heat a pan over medium-high heat and add the coconut. Stir frequently until nicely toasted. Do not walk away from the pan as the coconut starts to burn very quickly! Pour the coconut into a small bowl and let cool for about 5 minutes. You can skip the toasting step but I think it adds so much flavor to the crust! Place all the crust ingredients in a high-powered blender and process at low speed until the mixture starts to clump together. Don't process so long that it becomes pasty. When you pinch some of the mixture between your fingers, it should easily clump together. If it doesn't, add a tiny bit of water and process again until it does. Divide the mixture between the liners (17 grams per liner) and use the bottom of a shot glass or your fingers to press the mixture firmly over the bottom of the liners. Place the pan in the refrigerator while you prepare the filling. In a medium saucepan or pot, mix all the filling ingredients together and warm them over low heat just until they're slightly warm and the coconut cream and oil are melted. Wipe out the blender jar using a paper towel and pour the filling mixture in the blender. Blend for about 30-60 seconds at high speed until totally smooth. The mixture should be totally smooth, with the exception of raspberry seeds. Pour about 1/4 cup (45 grams) of filling over each crust. Pour the remaining filling in the ramekins or another kind of dish. Refrigerate for about 6 hours or until firm. If you're in a hurry, place the pan in the freezer. Refrigerate the pies in an airtight container for up to 3 days. If you freeze them overnight, they'll need about 70-80 minutes at room temperature to defrost or about 1 1/2 - 2 hours in the refrigerator. Once properly defrosted, they should be totally creamy. Place the cashews in a small pot, pan or mug and cover with boiling water. Let sit for 1 hour. Drain the water. If you use frozen raspberries, you'll likely need 4 cups to reach 384 grams. You'll also want to thaw them first or quickly heat them in the pan before adding the rest of the ingredients in Step 5. I haven't tried this recipe with other types of berries and am not very hopeful that it'd work well without reworking the recipe. 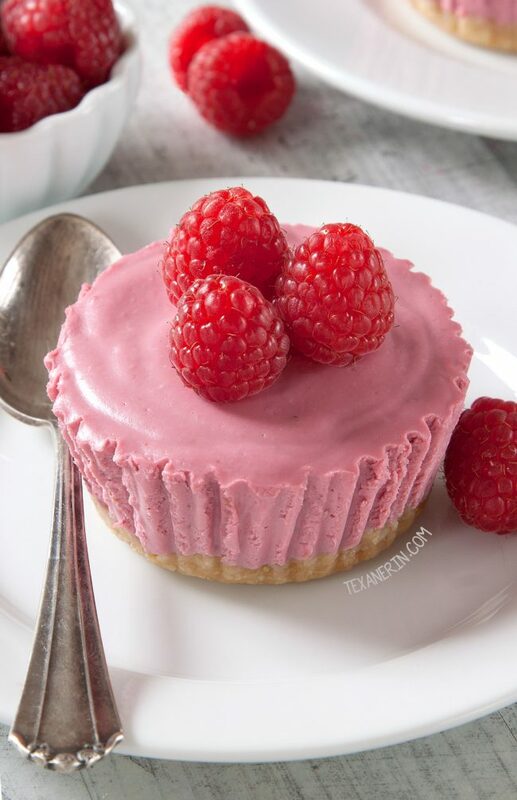 62 comments on “Paleo No-Bake Raspberry Cream Pies (vegan, grain-free, gluten-free)” — Add one! Can I make this recipe with a substitute for the nuts? I’m allergic to nuts. It looks so yummy. I thought I’d ask. Unfortunately there’s no sub for nuts in this and it’s the base of the recipe. :( Sorry about that! Love this filling idea! How do you think this would hold up as a filling in a layer cake? Do you think it would be too rich? It is pretty rich but I think it’d be amazing! But the problem is that after blending it together, it’s really liquid. Once it’s chilled, it’s too firm to spread. So you’d have to find the right moment to spread it between the layers. I’m not sure if it’d work out so well. If you do try, I’d love to hear how it goes! Erin you are the GODDESS of paleo treats! THANK YOU! All of your recipes are so well designed and always turn out perfectly! I had a question on this one – would basically any other type of frozen. berry work? Strawberry? Blueberry? What if I wanted to make something like a lemon tart? Similar to the Hail Merry lemon tarts? Could I just add more cashew and lemon? Thanks! Aww, thank you! You made my day. :) I’m so happy you’ve been enjoying the recipes! That’s a great question. I thought any frozen berry would work but so far that hasn’t been true! I tried with strawberries and had to rework the recipe quite a little (I posted this as paleo strawberry cheesecake). But to be honest, I really prefer these raspberry pies! The berry flavor is more intense and more creamy (there’s so much more water in strawberries). I haven’t tried blueberries so I’m not sure about that. And oooh! If you want a citrusy version of this, I have a treat for you. :D paleo key lime pies. I’d love to hear how they come out if you try! And thank you again for your lovely comment! I really appreciate it. :) I hope your supper club goes well and that everyone will love the key lime pie as much as we do! Finally a vegan dessert with roasted cashews!! It’s so hard to find raw cashews here, but roasted ones are very easy to get. Thankyou soo much! I am highly allergic to cashews… but no other nuts. Can those be substituted? This looks delicious!! Thanks! And I unfortunately don’t think so. Cashews are pretty unique in how soft and creamy they get with soaking. Sorry about that! Macadamia nuts are soft and so are pecans. I have made crusts using them. But while the macadamia nuts are soft and I think they could be used with a high powered blender for the filling, they also have a stronger flavor than cashews… But it’s worth a try in my opinion. Good luck! When I defrost mine, hardly any liquid comes off of them. If the same isn’t true of yours, then definitely get rid of the water. :) Hope you’ll enjoy them! These look yummy, but I’m allergic to maple. 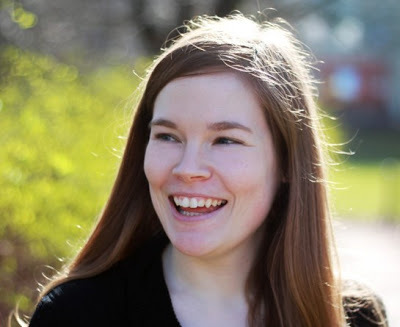 What would you suggest as a substitute? Thanks! You could try honey or agave, though I haven’t tried them in this recipe. I’d add 6 tablespoons to the filling, taste and add more, bit by bit until it’s sweet enough for you. Hope you’ll enjoy them! These look wow! I am looking forward to making them next weekend. Is possible to freeze these pies? I’d like to make them on Sunday to be served on Wednesday? Thanks! And yes they can. :) There are directions on how to defrost them in instructions. Hope you’ll enjoy them! Thank you for such a nice comment! :) I’m thrilled that your entire family loved them. I know the boys can be hard to convince when it comes to healthy sweets so it’s great that they liked them, too. Thanks again for your comment! THANK. YOU. I made this last night to serve at today’s Christmas meal, and it was a real hit. “Divine,” “perfect,” and “beautiful” were words used by my family to describe it. I made it with strawberries instead and I added about a scant tablespoon of nutritional yeast to add a cheesecake taste to it. I’m saving this recipe for sure! Merry Christmas! First of all, I am so sorry for my slow reply! I’m happy to hear that the pies were a hit. Your nutritional yeast addition is really interesting! I’ll have to try that. Thanks a bunch for your super thoughtful comment (and sorry again for the slow answer!). These were a hit! Thank you so much for the recipe. What a beautiful mousse like consistency. And the colour is just divine! Whilst I’m very keen to try adding some Gelatin Powder like another reader had, I wanted to keep this vegan so I can make it for my Sister in Law. So my tip would be to add 1/4 cup of chia seeds when you pop it in the blender. Hi there! They can be frozen. The last step tells you how to defrost them. :) Hope your visitors will enjoy them! what do you mean by ‘roasted’ cashews..do you buy them that way or do you roast them yourself & then soak them? These are delicious and so beautiful. I will use this crust for other things like mousse. I don’t eat grains so this works perfectly. I added a tiny bit of collagen gelatin and I think it helped set the raspberries a little. It worked perfectly. Thank you so much for this recipe. I’m looking forward to trying more. Interesting! How much collagen gelatin did you use? And which brand? I’ll have to try that, just because I’m curious. :) Thank you so much for your comment! I hope you’ll enjoy the other recipes just as much. I used Great Lakes – the one in the orange container because it’s thickening. I threw in about a tablespoon. It doesn’t take much. OMG! These are gorgeous! I love the color and flavors! I’m totally with you on this one! I would want soft and creamy with these! The color is beautiful too! I LOVE pink food!! These little raspberry pies look so pretty and I bet they tasted great with all of that fruit! Yumm-o! Oh my gosh, these are so cute and look utterly delicious. I could eat a dozen of these. Thanks! By the way, I’m normally a pig but could only eat 2 of these at once. They’re so filling! I love and appreciate your honesty and all your helpful tips! That crust sounds like one I will use over and over! Love the natural color of these raspberry cream pies! Love the abundance of berries in these!! They look just perfect. Great tip on using all room temperature ingredients! Oh my goodness, I can only imagine how refreshing and FLAVORFUL these are! And that texture….wow! I know you said that there is no substitute for the cashews….but, would macadamia nuts work? I thought that cashews were the only kind of nut that worked in making vegan cheesecake (although these pies really aren’t like cheesecake at all) but I just looked into it. It seems that people have used macadamia nuts the same way they use cashews! So I guess it could work but I’m not positive as I haven’t tried it. It at least sounds like a yummy combination. :) I’d love to hear how it goes if you try it out! oh my gosh! these look like such a great treat! They sure look creamy and I love the color. Ha!! I am a PINK person! They look perfect no matter what they are! I love how light and fluffy they look! I don’t care what you call them, I totally want one! And I am with you, the soft and creamy texture sounds amazing! These are so pretty! And I love that they are paleo!